Posted Monday, December 17th, 2012 by Ink Technologies. 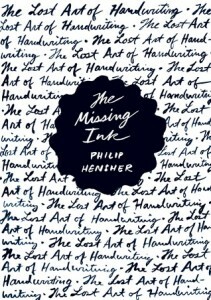 Among the many things I learned from Philip Hensher’s lively new book, “The Missing Ink: The Lost Art of Handwriting,” is the extent to which the teaching of handwriting was intended to enhance moral development. Nineteenth century America was dominated by copperplate, an ornate style – you can see it in the Coca-Cola logo – promoted with missionary zeal by Platt Rogers Spencer. More practical, business-friendly models eventually won out, but handwriting is still widely seen as an indicator of one’s character. The reviewer, Gregory Leon Miller at the San Francisco Chronicle, begins by acknowledging that he “can’t write proper cursive” and that he’s “forgotten how several of the letters are meant to look.” We hadn’t thought about this before but…we have to acknowledge that we’re not 100% sure how they’re all supposed to look either. We did a post the other day hoping to encourage readers to give handmade gifts a chance this holiday, so in a way we’re on par with the lamentations of Mr. Hensher, while we can’t speak directly to the history of handwriting and its cultural or historical significance. But we do have to ask, could you pen a letter to a loved one or a colleague completely, in perfect cursive? Ink Technologies, LLC. has grown to be a leading supplier of color printing products for use in printers by Xerox, Konica-Minolta, Hewlett-Packard, Lexmark, Okidata, Samsung and other leading manufacturers. In addition to our high-quality, value-priced products, we strive to offer the best customer service and after-sale support in the printer supply business. « Make a Real Memory This Holiday!